In a couple of months, you'll be able to buy a miniature version of the famous spaceship that made the Kessel Run in less than 12 parsecs. Lego will start selling a special "Solo: A Star Wars Story" set this April, about a month before the highly anticipated movie's May 25 premiere. 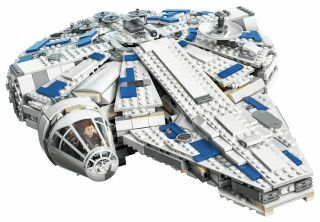 The big takeaway is Lego's Kessel Run Millennium Falcon doesn't look like the "fastest hunk of junk in the galaxy" that we're used to. It's clean (and white!) and seems to be missing quad blasters and that gap in the front we've seen in past models. Here's Lego's description of the set: "Outsmart the villainous overseers and escape the Kessel Mines aboard the amazing Millennium Falcon! Pull amazing maneuvers from the cockpit. Jump in the laser turrets and fire back at pursuing craft. Then check the hyperdrive and get ready to jump to safety! After all that excitement, kick back with Han and his friends with a drink from the bar, while you let Chewbacca win at Dejarik. Then it's off to bed for a well-earned snooze in the bunk aboard the fastest ship in the galaxy!" The Chewbacca minifig from the "Kessel Run Millennium Falcon" Lego set. And yes, space nerds, we know: A parsec is a unit of distance (equal to 3.26 light-years, in fact), not time. So Han's Kessel Run boast makes no sense — unless he was bragging about taking a different, shorter route.